HO-HO-HO! Moon Games presents Jingle Spin Slot a Christmas themed 5-reels and 20 payline slot machine that is squeezed with stunning symbols that compliments the magical feel of Christmas season. Embark on this fascinating game where you can get a thrill out of its profusion of features and keep an eye open for some potential cosmic wins. Play Jingle Spin Slot on the go and enjoy its visually pleasing graphics! Jingle Spin Slot is an entertaining slot machine that was designed with finesse by NetEnt. There is the AutoPlay which allows you to spin the reels without pressing on the spin button. Next, there’s the Max Bet which will allow you to have a spinning episode at the highest bet level and at the current coin value. Now, when it comes to the symbols, you will find an ocean of Christmas related symbols like the dwarves that sits at the top of the reels, Christmas tree to the left of the slot machine and the final touch is the Santa Clause which holds a lever. 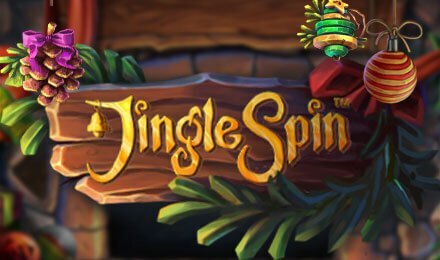 Jingle Spin Slot is filled to the brim with symbols like orange with cinnamon sticks, pinecones, red/gold bauble and bells. Bet Levels: The Bet Levels ranges from 1 to 10 on Jingle Spin Slot. Amount of Paylines Selection: The 20 Paylines on this online slot machine remains fixed. Coin Values: The min coin value is 0.01 and the maximum coin value is 1. The wild on this Christmas themed online slot machine is the gift box and it can substitute all the symbols to create some amazing winning combinations. Let’s find out how this feature is played. If a wild symbol turns up under the reel where there’s a spreading wild bauble, this feature will activate. The wild symbol will, therefore, transform into a spreading wild and it will cause all the diagonal and adjacent signs into some extra wilds. The Free Spins Bauble Feature here is launched when a wild symbol appears under the reel in which there’s the Free Spins Bauble. Then, you will get to bask in between 7 and 50 Free Spins. Amazing, right? The number that appears on the Free Spins Bauble. This feature is activated when a wild symbol comes into view under the reel where the coin amount is located. You will enjoy the number that is shown on the coin. During this feature, you can enjoy up to 125 times your stake. Whenever you are spinning the reels of Jingle Spin Slot and a wild arrives under a reel where the Surprise Bauble is found, the feature will be triggered.